23 years ago today, Jurassic Park had its first official premiere in Washington D.C. I don't know a lot about the premiere myself but it seems as though Princess Diana attended to meet the cast and crew, which is pretty random/cool. So nice to see Bob Peck in an interview. And Richard Attenborough was so incredibly impressed with the visual effects. Great video. Omg I love stuff like this! It really takes me back watching this kind of stuff. The fun, the excitement, the anticipation. Kind of like what we felt last year, but in a much more mysterious and fulfilling way. In a way, it is kind of why I like JJ Abrams style of "don't show them the movie!" til it is out. Maybe that is why I loved 10 Cloverfield Lane so much... there wasn't that much time to anticipate, because you saw next to nothing, and then suddenly it was there! Quote: 23 years ago today, Jurassic Park had its first official premiere in Washington D.C. I don't know a lot about the premiere myself but it seems as though Princess Diana attended to meet the cast and crew, which is pretty random/cool. Princess Diana attended the Royal Premiere in London - I think it was quite common for big films to premiere with one or more of the British royals attending. This is a great video, I've never seen it before! Lovely to have all the actors interviewed. It's a reminder of how massively popular and anticipated Jurassic Park was. I really love the Royal Premiere stuff. Every cast & crew member interviewed in that video is considered the coolest in my book. Everyone is just so damn smooth, cool and collected. It's also really cool to see the Princess come through and see how each person reacts. I love Goldblum of course. He acts as creepy as ever in that video. He's the best. (06-09-2016, 07:14 PM)Neelis Wrote: Princess Diana attended the Royal Premiere in London - I think it was quite common for big films to premiere with one or more of the British royals attending. Thanks for clarifying! Very cool that she visited but still seems so odd. I'd never expect the Royals to even consider watching films like Jurassic Park. Prince Charles, heir to the British throne no less, attended the premiere of Spice World in 1995. I'd say Diana saw the better film. Quote: Ariana had the pleasure of sitting with Diana during the movie and was honored to present the Princess with the bouquet of flowers you see her holding. Steven told Ariana later that he had chosen her to give the bouquet because he knew she would have the courage to use the right words, “Your Royal Highness” when addressing the princess. Princess Diana was excited about the film and told Ariana, "I'll have to bring William and Harry to this film very soon, they will love it." Great pictures and info, thanks for sharing! "The brightest stars in this creative constellation are the technicians: When Oscar Day rolls around, there will be no excuses for muddled acceptance speeches." Chaos theory, a new form of mathematics, studies unpredictable systems — weather, the stock market, rioting crowds — any system that will eventually show unpredictable behavior, such as a theme park filled with dinosaurs or, for instance, how many people will come to a movie. While chaos theory in Michael Crichton's best-selling novel correctly predicts that a modern-day system containing dinosaurs will result in unimaginable catastrophe, you don't need chaos theory to predict this jaw-dropping, palm-sweating, eye-popping entertainment will become the Blockbustersaurus rex, the king of all blockbusters. In theme parke-ese, it's an EEEEEE ride. Steven Spielberg has cloned classic strains from the highest lineage of monster/action movies, spliced them with the most realistic genes of family entertainment and unleashed them through the most powerful forces of technological aesthetic to create a truly colossal movie experience. With an all-star technical team, many of whom have pushed then envelope before in such juggernauts as Star Wars and Terminator 2: Judgment Day, Spielberg has wondrously implanted the highest strains of science fiction within the supple body of a very human story. Jurassic Park descends from a vaunted sci-fi narrative line: the fury that man unleashes when he tampers with the higher forces of creation. The arrogant provocateur in this case is John Hammond (Richard Attenborough), a twinkly old goat and self-made man who is kind of a dark cross between Colonel Sanders and Walt Disney. Hammond's spared no expense in creating the greatest theme park of them all: a secluded Caribbean isle that takes the theme park/animal arcade to its most unbelievable dimension. Hammond's crack team of scientists has managed to create real-life dinosaurs by DNA cloning. He's constructed an uberpark with every conceivable convenience and precaution built into its complex, computer-run system. Screenwriters Crichton and David Koepp expertly distill and present the story's complex scientific underpinnings into palatable and understandable explanations, while delicately lacing it with eruptive building blocks. Symphonically structured, with tender swells and light larks, Jurassic Park is superbly orchestrated as Spielberg masterfully works the emotional throttle, always appreciative of the human factor, and unleashes it to full ferocious power. 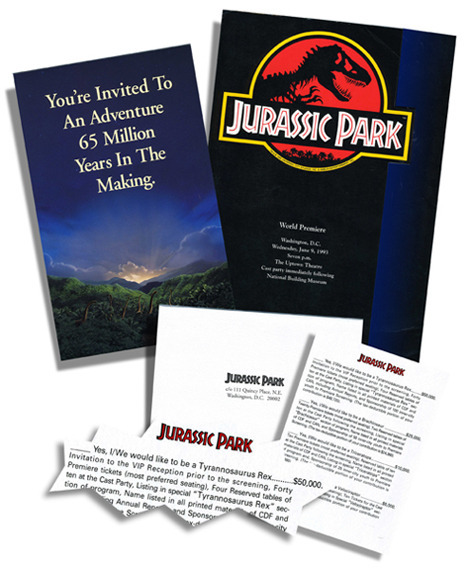 Jurassic Park is the highest form of its generic species, the mainstream movie. The brightest stars in this creative constellation are the technicians: When Oscar Day rolls around, there will be no excuses for muddled acceptance speeches. Among those who should start polishing: Stan Winston for the incredible live-action dinosaurs; Industrial Light & Magic's Dennis Muren for the full-motion dinosaurs, as well as dinosaur supervisor Phil Tippett. Similarly, composer John Williams' titanic score with its peals of trumpetry and cinematographer Dean Cundey's mesmeric lensing are terrifically gripping.